In today’s competitive economy leveraging your LGBTBE certification is key. How do you get noticed, contracts or build relationships with Supplier Diversity Managers at major corporations? In addition, opportunity provided to participate in the Shark Tank Contest. 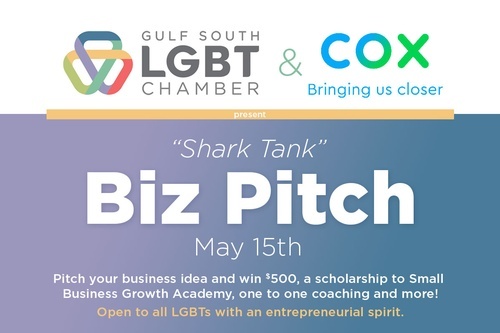 All Gulf South LGBT Chamber members, as well as LGBT-owned businesses are eligible to compete (click the links below for the Shark Tank Pitch Guidelines and Application). Register on-line HERE and complete a brief application. All applications must be completed/submitted by Sunday, April 28th. Top 3 applicants will be selected by the Chamber and Cox Communications to present their pitch during the event on Wednesday, May 15th. Pitches cannot exceed 5 minutes. Finalists are expected to deliver approximately five minutes’ worth of content. Each pitch will be followed by a five-minute question/answer session with the judges (from Cox Communications), who will ask questions or clarification regarding the pitch. All pitches will be judged on four criteria: innovative idea, passion for their business plan, demonstration of competitive advantage, and response to the judge’s questions. SIGN UP FOR THE PITCH HERE! This is event is free to members and corporate sponsors of the Gulf South LGBT Chamber of Commerce and $10 for non-members. Food and drinks will be provided.